FJU beat NTNU for UBA title. Taiwanese fans had a March Madness of its own. FJU upset NTNU in the national title game Wednesday in overtime, winning its first title in 12 years. Powerhouse TPEC not only saw its winning streak stopped at 155 games but also was denied of its 13th straight UBA title. Hsing Wu College upset CCU in the quarterfinal and advanced to the final four for the first time. HWC lost two games in the semifinal and bronze medal game by large margins and finished fourth, but it was still a memorable cinderella run for the little-known school. 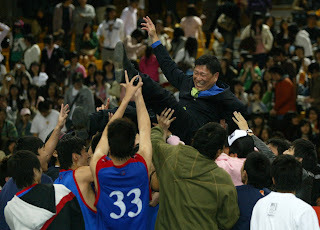 Chen Shun-hsiang had 32 points in the title game. Chen Shun-hsiang made 8 of 10 from downtown en route to his game-high 32 points in a overtime 93-91 win over NTNU Wednesday in the UBA championship game, leading Fu Jen University to its sixth UBA title and the first in 12 years. Guard Chou Tzu-hua had 12 points, 5 rebounds, 6 assists and 4 steals in FJU's second upset win in as many night. FJU upset defending TPEC in the semifinal on Tuesday. 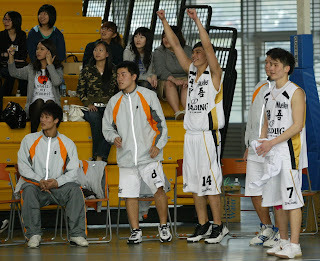 FJU forward Wang Chien-wei had 13 points while Chen Ching-huan tallied 16 points and 7 boards. NTNU, at the same time, couldn't get the monkey off its back. The hands-on favorite abruptly ended its 14-game winning streak and lost for the sixth time in the national championship game -- four times to TPEC and one time to CCU and FJU. 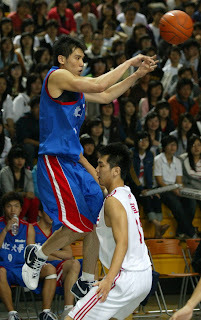 Chien Chia-hung had 28 points in the losing effort. Center Wu Tai-hao had 16 points, 8 rebounds and 5 assists while Deng An-cheng had 27 points. TPEC failed to defend its title. FJU routed TPEC 74-59 behind Wang Chien-wei's 23 points and 18 rebounds and Chen Shun-hsiang's 15 points. The Catholic school ended its 21-game losing streak to TPEC and stopped TPEC's quest for its 13th straight UBA title. FJU will meet NTNU, which booked its sixth finals appearance after a 111-77 win over cinderella team HWC in the other semifinal matchup, in the championship game. In the 5-8 classification games, CCU swingman Lin Ching-pang had his first career triple-double -- 16 points, 11 rebounds and 10 assists -- in a victory over NTUA. HWC, George Mason Taiwan version. Hsing Wu College (HWC), which finished an all-time best 6th last season, pulled off the biggest upset in the quarters when it edged CCU 87-84 and advanced to the Final Four for the first time in history. Quite an achievement for a school that has been having a hard time recruiting basketball players.